The other day, I shared with y’all my new decorating strategy for 2015. My goal by the end of next year is to have the breakfast room and living room completely finished, and then to have every other room in my house looking presentable…not perfect, not finished according to my final plan, but presentable. I’m hoping that by the end of next year, there won’t be one single room in my house that makes me cringe when guests enter. I’m calling this plan Mission: M.I.P. (make it presentable). Be forewarned…you’ll (hopefully) be seeing that quite a bit next year. So I’ve been thinking through my goals for each room. 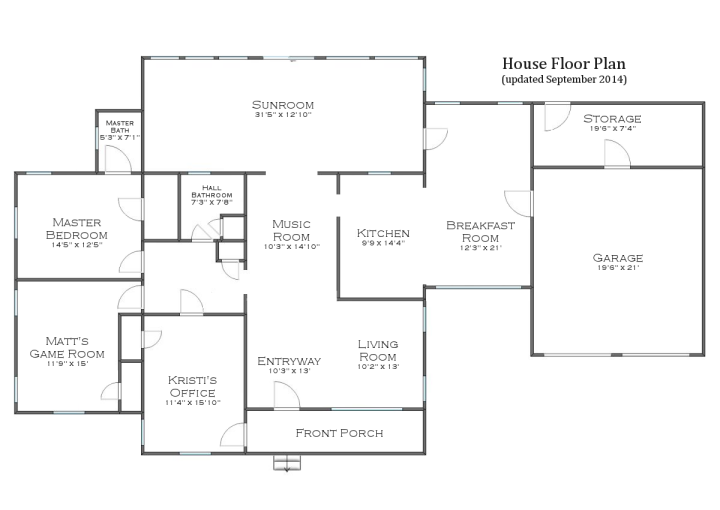 In doing so, I’ve taken another look at the floor plan of the house, and tried to come up with the perfect, final plan. I thought that was important to do because if, in the future, a room is going to be completely torn down and rebuilt (the sunroom), completely moved (the master bedroom), etc., then that will determine just how much money, time, and effort I’m willing to put into it right now. So I needed to know where I’m heading — the final goal — in order to now what my immediate plans are for each room. The current master bedroom closet will eventually become a hallway that extends into what is now the sunroom, and will continue to wrap around the current hallway bathroom. The current master bedroom will become the master bathroom. The reason I made this switch is because of windows. Our bedroom currently has two windows, but when we add on, one of those windows will have to be removed. That leaves one lone window in the bedroom. I like a bedroom with a lot of natural light since we don’t use an alarm clock and literally rise with the sun each morning. I love being awakened by the sun, so I like a room with lots of windows. And if we’re adding on anyway, then we may as well make the switch if it makes more sense.That size — 14.5′ x 12.5′ — seems pretty big for a master bathroom, so it will probably also include walk-in closets, and I might even carve out some space from that room for a hallway linen closet. That puts the master bedroom in the back corner of the house, which means more windows and more light. I also like that we’ll have windows not only to the side of the house, but we’ll also have windows (or perhaps French doors) to the back yard as well. A large utility/storage room will be added beside the bedroom in the new hallway. This makes more sense to me than having the utility room on the other side of the house. It’s actually where I had originally planned to put it, but I didn’t think of the hallway idea until a couple of days ago. The family room will be on the right side of what’s now the sunroom, which will be torn down and completely rebuilt. And you’ll notice that I’ve decided to leave the doorway from the family room to the dining room open for better flow. It just makes more sense rather than making people walk through the kitchen to get to the dining room. Since I’m leaving that doorway open, it just makes no sense to have a seating area at the back side of that room. As much as I loved the idea of a fireplace and with comfy seating around it, I just had to make a decision between the seating area and a door since a seating area would interfere with the traffic pattern. (Remember…a wheelchair-bound person lives here, so traffic patterns in this house require even more room than at most houses.) And really, how many seating areas does a house need? I already have a front living room, and I’ll eventually have a cozy family room at the back of the house. Do I really need more seating areas? I finished my kitchen two months ago, and I’ve cooked almost every single meal we’ve eaten since then. I spend a lot of time in my kitchen. In that time, I’ve realized that I really do want a pantry. It doesn’t have to be a fancy butler’s pantry like I once talked about. It just needs to be a functional pantry with a door that closes (preferably a pocket door) so that I can store extra non-perishables, my china that didn’t fit into the glass-front cabinets in the kitchen, larger appliances that we don’t use every day (Champion juicer, hydraulic juice press, food dehydrator, etc. And since I foresee us doing the Paleo diet for the rest of our lives, I’d also like to put a deep freezer in there so that we can buy meat in bulk, and so that I can also learn how to do bulk/freezer cooking so that perhaps I can spend less time in the kitchen during the week.All of that to say that I’ll be carving out a large area at the back of the current breakfast room to make a walk-in pantry for those things. I’m now officially calling the breakfast room the dining room. The whole reason I didn’t call it a dining room in the past is because I planned to close up the doorway from that room to the sunroom (future family room), making the only access to the breakfast room through the kitchen. That’s a very strange arrangement for a dining room, so the term “breakfast room” seemed more appropriate. But it did always seem strange to me that my breakfast room was the second largest room in the entire house, second only to the massive sunroom. The breakfast room felt a bit cavernous (about 22 feet long! ), and also a bit overwhelming when it came to coming up with a decorating plan. This new, smaller, more manageable size is just perfect, and I can already picture it completely decorated. And since it will now be accessible via the kitchen and the sunroom (family room), it’s officially a dining room. It is still very unconventional to have a doorway leading into the garage right smack dab in a dining room, but I’m okay with it. Things can’t always be 100% perfect when you’re retrofitting an old house to meet current needs. It’s a small quirk that I can totally live with. That leaves a little nook at the back of the room, right beside the pantry, where I’ll be keeping one window. I’m thinking about replacing that tall window with the shorter window that’s currently in the hallway bathroom (which we don’t need in the bathroom anymore), and turning that nook into a drink station. I’d love to have a little sink, an ice maker, a small refrigerator for drinks, and our coffee maker over there. It seems like the perfect place for that stuff since it’s easily accessible from the kitchen, the dining room, and the family room. I feel like this plan may need a few minor tweaks, but this overall plan is the one that will stick. Of all the plans I’ve come up with (and there have been many!! ), this one seems to meet all of our practical needs, puts less emphasis on things I don’t need (like a butler’s pantry and yet another seating area), and has better flow from one space to another. I think it’s a winner! 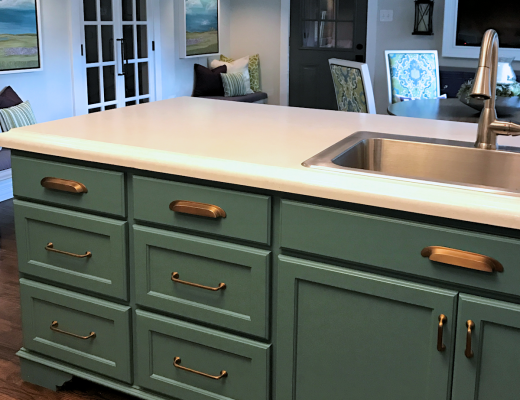 Next Post My Kitchen Remodel - Sources, Cost Breakdown, and the Grand Total! Long time reader, first time commenter here. I am so impressed by your vision and skill. I absolutely love what you’ve come up with for the new layout. It makes much more sense. Looking forward to following along in the New Year as you implement these changes! Have a Merry Christmas! Love the new plan and yes it all flows better which is much more practical and of course better for the hubby. I wish you and yours a blessed and safe Merry Christmas and Happy New Year! Hope you get some well-deserved rest from all of your decorating endeavors. I look forward to your plans for the New Year! Now you’re talking! That looks perfect! Enjoy the holidays and fitting into smaller clothes! Love seeing all your projects from start to finish. You are amazing. That makes sense to me. It seems more practical than creating an alcove there. It would also allow fir the door to the garage to be pushed back further. Having that door in the middle I’d the dining room wall seems awkward to me. Unfortunately that door can’t be pushed back any more than it is. It’s already at the back wall of the garage. I could push it all the way back so that it goes into the storage room rather than the garage, but that’s quite a maze to go through to get from my car in the garage into the house, and I would have to eliminate the pantry altogether if the door is there. She has a plan for that space! She said it is going to be a place for drinks – will have an icemaker, small fridge , coffee maker, etc. I did consider that, but there’s only three feet (approximately) of space on that wall before you hit the door that leads from the dining room to the family room/sunroom. So if I do a pantry all the way across that wall, the most it could be is a wall of deep shelves behind doors. That might be fine, except that there wouldn’t be enough room for a deep freezer, and I really don’t want to have to put that in my garage. I really am still debating the design, but I really want whatever design I go with to be able to fit a deep freezer. we have two small deep freezer. one is for meat and stuff and one is for the other stuff that we do not want to be with the meat. I love the drink alcove idea! I really like this plan. I too love a big pantry. Putting it in that location will help disguise the different ceiling levels. Leaving the window near the door to the family room will keep the light flowing from back to front, and putting the utility room near the bedrooms is efficient. I like the doorway to the dining room from the future family room, too. Overall, this plan flows well and gives you all the features you want/need. Your post a few days back about using a paint technique to mimic grasscloth makes a lot of sense in those rooms that you plan to completely remodel in future. Paint is inexpensive compared to wallpaper or grasscloth, and you get to learn a new technique! I don’t know how I’ll survive without your daily posts until the new year, but you certainly deserve a well-earned vacation. Best Wishes to you and Matt for a healthy and happy holiday season! Consider putting that pocket door in your pantry (in your dining room) on the other wall and put in some frosted glass panes. That way you get to keep the light coming in from that window (though it looks like you are trying to close it up). Just a thought. Nobody wants guests going through the kitchen to the DR, so that leaves the trek from LR thru music room to sun room, hallway and finally DR. I think I would switch the music room and DR. OR, I would extend the front DR wall a bit, change that one LR window to a doorway and use that as an entrance to the DR. I love this new floor plan but especially the door from garage to dining and right into the kitchen with all those groceries LOL. Does your head hurt with all these ideas constantly going through it ? Mine would for sure 🙂 Wishing you and yours a very Merry Christmas and a Happy New Year, can’t wait to see what you have in store for us in 2015. Many beautiful blessings to you and Matt. Love the new and improved layout of the house!…I think it does have a better flow, and I love the access from the family room circeling the other room…You are on a mission…LOL!…Merry Christmas & a Happy New Year Kristi! Looks great, Kristi! The only change I would make would be in the area where the little hall closet is outside the hall bath. Maybe move the closet to the wall next to the door to your office, and extending the wall on the bathroom. Would make that bath much larger and give you some linen storage. If not, it still is a great plan. Love this…thought of something interesting. ..since you like to come up with innovative ideas, why not develop a secret door that leads into your garage. Like a camouflaged door of some sort. Maybe if you had enough room it could look like a piece of built-in furniture, bookcase, or something cool? I like that idea! Not sure if I can pull it off, though. I’d need to look at some inspiration pictures to see how they did it. Hope you can see the video? Merry Christmas to you and Matt, hope you have a beautiful holiday! Oh my gosh, that’s awesome!!! I think I could actually do something like that. Doesn’t seem too hard. I wish I could see more details, like how the baseboards look on the hinged side, and what kind of hinges they used. Here is another one with more details, opening inward towards what would be your garage. I imagine you could beef it up to pass code? There are several on Youtube: https://www.youtube.com/watch?v=REMS7OLD-os How cool would this be, I bet Matt would be rubbing his hands together (muahaha!!!) on one of these, I know my hubby would!! I’m wondering why you didn’t put a door from the master bathroom into Matt’s game room? Is it because of the flow or ability to make a doorway between those 2 rooms? I would just think that for Matt in his wheelchair it’d be nice to have access to the bathroom without having to navigate the hallway…just wondering..love the work that you’ve done. I agree. I thought a pocket door from Matt’s game room into the master bath would be so much more convenient for him. I like this plan, but also agree, the path the the bathroom is far for a wheelchair from Matts game room. We did talk about that, but I just didn’t put it on the floor plan. It’s still an option if he feels like he needs it. Love the plan! The only change I would make is to the utility/storage room next to the Master BR. I would turn that into a walk-in closet for the master (I didn’t see one in your plan.) Hope you and Matt have a wonderful Christmas & New Year! The closet space will be carved out of the master bathroom. I need a utility room. Otherwise, I have no place for a washer and dryer. What plan do you use to draw your floor plans? They always look so nice. 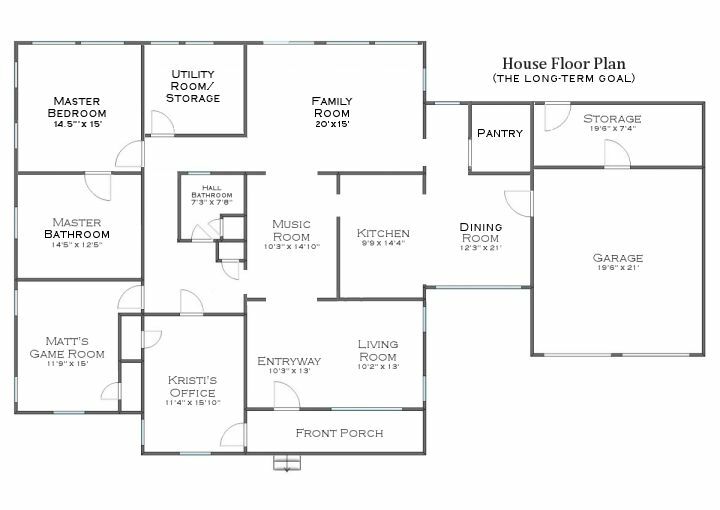 I used Roomsketcher to do the original plan, but I make changes using Paint Shop Pro, which is just a photo editor, and not a program specifically for floor plans. Love the new changes to layout! I especially appreciate that you can walk in a circle through the kitchen/music/dining/family rooms – no backtracking is awesome! That also makes all other rooms so much more easily accessible! Great thinking, Kristi! May you, Matt and your families have a joyous and blessed Christmas! Love the new direction you are going in, and I can’t wait to see what you do in 2015. Merry Christmas and a Happy and Healthy New Year to you and Matt, and to your whole family! This is the best floor plan I have seen for your house and keeping in mind that you do have to have wheel chair accessibility. Great job Krist! What if you got a glass exterior door going to the garage and added the fretwork like you did in the music room? Would that make it blend with the decor better? I am loving all the progress you are making. You also help me remember that I am not the only one trying to accomplish 500 hundred different things. We bought a 100 year house 3 years ago and I am redoing it a room at a time. Sometimes people don’t understand why I will stop removing wallpaper or hanging drywall to go make a piece of furniture or do some sort of craft project. I appreciated the remarks you made in response to those wondering why you paused work on the condo to make the bookshelf etc. Doing those sorts of things saves my sanity! Hmmm…interesting idea! I’m not sure that it would be something I could make, though. I doubt a glass and MDF exterior door leading into a garage would meet code. Thanks for the always inspiring blog posts Kristi! You are my absolutely favourite. Merry Christmas and continued blessings. I like the new floor plan a lot. I like that a person can move from one area to another easily without backtracking. The flow seems especially easy for Matt. P.S. I like the ideas of french doors in the master as an easier/quicker escape route for Matt in case of fire or something. I felt weird thinking of that, but it honestly was the first thing that jumped in my mind when I read that you were considering french doors. It all makes perfect sense! Thank you for taking us on the journey this past year. You, Matt and yours have a wonderful Christmas and a happy New Year. I like your new plan a lot. I think you’ll be glad to have the extra storage vs. the extra space in your dining and sun rooms. You still have plenty of room. Also, your goals to complete a couple of rooms and to make the others presentable is a good one – just make sure you don’t overwork yourself to the point that you get exhausted and discouraged. Good luck with the sale of the condo in 2015! Marry Christmas and all the best to you and your family in 2015. Really? Marry instead of Merry? Where is my brain? Don’t feel badly Sue….we received a PRINTED Christmas card today from a banker…..PRINTED with Marry Christmas….Yikes…. I am sure that you put a lot of thought into the new plan. you should be very proud. I hope that you can stick to it to keep your stress to a minimum. Merry Christmas to you and Matt and a healthy New Year. Love the new plan – the new ideas really make a lot more sense and had to develop over a period of you already living in and getting the feeling for your house! I’m looking forward to following your every post next year! I wish you a very merry Christmas and a relaxed and wonderful time with your family. All the best to you and yours for next year, and thank you for sharing your ideas, projects, tutorials and advice!! You put so much effort into making your home the best it can be! One though, there’s a door on the right side of the family room, near the pantry. Why not widen that doorway more? You could still have room for a small coffee bar in front of the window but much easier access through that whole area. I probably will widen it to about 40 inches. The only thought I had is to move the door to the pantry to the other wall just for ease of bringing stuff in from the garage. Of course if you use a pocket door, that eliminates that wall for hanging really heavy stuff on. One warning, doesn’t matter how I arrange it on the conveyor belt, the person packing my groceries will always mix up the stuff going to my pantry with the stuff going directly to my kitchen. Never fails! You are truly talented! Best wishes for a Merry Christmas and Happy New Year! Merry Christmas Kristi!!! I love the new layout! Kristi, you have made so many improvements to your home and the condo that I’m always afraid you will run out of energy! Please keep going and we’ll all follow! Thank you for this past year and all you have shared with all of us! Merry Christmas and may God Bless! I love the new layout of your floor plan and the direction you’re going in the new year!! I especially love the MIP plan and I think that will cut down a lot of your inner stress in the new year. Plus it gives you some time to think about the dinning room and the living room and make plans for how to “finish” them the way you want them. I know you didn’t ask but here are my floor plan tweaks. 😉 I don’t think Matt needs a doorway to the master bath with the powder room just across the hall. Unless he wants one of course! That master bath is quite large and I think you could put your master closet in the master bath but leave three feet and open the wall from the hallway side to put your linen closet there. Remove the tiny linen closet to open up the hallway more or extend the powder room out a couple of feet if you need more space or storage in there. The only thing I don’t like about these tweaks is that rather than having beautiful art on the wall when you look into the hallway from the music room is that instead you’ll be looking in at another door. 🙁 With this idea though you won’t necessarily have to take closet space from the utility room. I would put the washer and dryer on the bedroom wall side of the utility room so that the sound of them running doesn’t interfere as much with TV / music listening during the day. You’ll just have to make a point of doing laundry during the day only and not throwing a load in at bedtime (which I am famous for, lol) Over there by the doorway to alcove I’m sure that’s a load bearing wall that separates the family room from the dinning room but couldn’t you put in a massive header and just take out the wall that separates the two spaces? Then you wouldn’t have the odd alcove area and it would be a lot less cramped. Then you could put a snack bar on the wall that backs up against the kitchen. I would change the pantry doorway to face the dinning room. Forget about utilitarian doors for the pantry and garage an do some that are really fancy. Full length leaded glass and etching maybe?? Anyway, it’s been a joy to watch you progress through your projects and to learn all your secrets to your success in decorating and weight loss. I’m looking forward to being impressed all over again in 2015! Merry Christmas to you, Matt and your families and have a Happy New Year! Looking forward to what you bring us in 2015! All my very best wishes for a happy holiday… I hope Santa brings you everything you’ve asked for AND MORE! Correct me please if I am wrong but the new plan looks like it eliminated the peninsula which contains your dishwasher and sink. Am I missing something??? I’m not eliminating anything. 🙂 I just never bothered to put any of the kitchen cabinets on the floor plan. Got it! In looking at the old footprint I see the same thing. Phew, had me worried for a second. I see that as a half wall, while you see it as cabinets. So it will be the same, just the front part of the old breakfast room will become a dining room. I think you will be very happy with the new layout. It looks especially easy for Matt to get around in his wheelchair. Hope you have a happy and blessed Christmas season. As always, blessings. About the garage door….if you are still doing wainscoting in the dining room you can just carry it across the door and do the same treatment on the top half as you do on your walls. Try to find a picture of the oval office in the white house and you will see what I mean. The doors just blend in with the walls on the inside. I’m not very familiar with floor plans so please forgive my ignorance, but what is the odd configuration of the hall bath with what appears to be 3 doors?? There’s one door into the bathroom, one door into the linen closet inside the bathroom, and a door into the hallway closet (originally a coat closet, but now it hold the huge air intake portion of the furnace, and will probably hold that part of the HVAC system once we get one). I’m doing a happy dance that the laundry is now right beside the master, where all the dirty laundry is generated. I also love the flow of movement your new plan has. Yes, definitely make the master wall of windows into triple french doors, with only the middle one opening. Not only is it a safety exit, it also gives you a great view back to the nature area you have out back. I would suggest a pocket door from the master bedroom into the master bath. There’s more than enough room in what is currently the master bedroom for both a master bath and master closet. I tend to disagree with others about a doorway from Matt’s game room into the master bath. That would cut up space you need for your closet. I think you should just widen the door to the hallway bathroom so that it is more easily accessible for Matt. You might even consider removing the tub and shower from the hallway bathroom so it has lots more room for moving around in there. That would make it a roomy half bath that all visitors would use in addition to you and Matt when you’re closest to it. I do agree with someone who suggested the opening from the dining room to the family room be widened, again for ease of movement for Matt. Everybody needs a large pantry! I do love to hide away all those things that aren’t used often, plus a place for a freezer. So happy you will be starting the new year with a clear vision. Now celebrate the rest of this year and rest on your laurels. You have made AMAZING progress this year! Can hardly wait to see what the new year holds. More importantly, the external door in your office, have you considered leaving it there as a door instead of changing it to a window. Then if you ever decide to go back to Interior Design Consulting full time, your clients could enter your office from that door and not go into the rest of the house. Just an idea, thinking about the future. Sooo…maybe you’re right. I should probably keep the door! Hey Kristi love your new floor plan. Yet I like the idea of you putting a doorway from Matt’s game room into the master bath. It sure would make it so much easier on him. I’m still looking for Mr. Right and think he would be a lot like Matt. lol I believe you two love each other very much. Just wondering does Matt have any male relatives that’s single? lol I love your blog and your drive and all your ideas. I’m looking forward to spending part of each day with you in 2015. If I’m not reading your blog then I’ll probably be using one of your post to make something. Planing on building the platform bed for my son right after New Years. Happy Holidays to Matt, you and all the family. Have a happy and safe New Year. It looks like a great plan. I love where you put the storage area and pantry. I’m wondering why you don’t switch the music room with the dining room to avoid the access problem completely.. The music room is actually the original dining room. I hate the idea of walking into the front door of the house, and the first thing you see straight ahead is a dining room. I also hate the idea of being forced to walk through a dining room to get to the family room, kitchen, etc. But the biggest problem with keeping that as the dining room is that I’d have to always keep the dining table shoved up against the wall (which is where it’s been since we moved in) so that Matt can get through that room. With the table in the middle of the room, which is where a dining table would naturally go, and where it needs to be so that the chairs are accessible on all sides, Matt can’t get around the table. My master bedroom is exactly the same size as yours is/will be – 14.5′ x 12.5′. You may think this is large, but if you’re given a choice, I would add just a wee bit more space, especially nowadays with furniture and beds being larger, especially Kings and Cal Kings, and also if you want to put any kind of bench at the foot of the bed and still have room to walk around it without feeling cramped. Any serious changes to room sizes or even the addition of a room should always be done with resale value considered. Even if you have absolutely no plans to move, you’d be surprised what life/fate has in store when you make any kind of emphatic statement like “I’m never moving again!” If someone could waive a magic wand and make my master a bit larger, say 14.5 x 13.5 or even 14, the size of the room would then be perfect! Oh, I definitely don’t think it’s large. Not at all. When I’m in the bedroom, it’s hard for me to imagine that our condo bedroom was even smaller. That’s why the new bedroom will be larger (14.5 x 15), and I’ll make it even larger than what is shown if at all possible. French doors (or sliding doors) to the back yard from your master bedroom will be one of the best gifts you could give yourself! on walk in closets: We deeded not to do walk-in closets in the house we built because they were floor space wasters :O) and we wanted every square inch we could get for living space. We just planned a very very long wall closet. It worked out well for us! You know, it’s interesting that I read your comment this morning, about an hour after looking at this picture…again! I keep going back to that picture. I love how the built in cabinet-style closets wrap around the French doors. And I do think you’re right…there’s so much wasted space in walk in closets. And I think it might be more difficult as far as accessibility for Matt. Having the entire wall of the bedroom on the back side of the house dedicated to closet space might be a much better idea, especially if it can look like that picture with the French door in the middle. I love that idea, and it would be WAY more closet space than we’ve ever had in any of the places we’ve lived so far. Looks great! Merry Christmas to you and I can’t wait to see what you come up with in 2015! 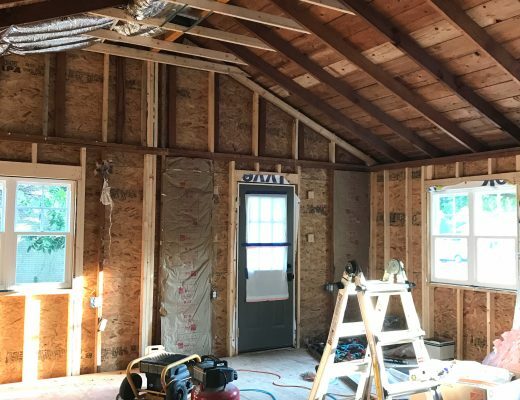 Consider giving Matt a door to the master bath from his game room. Great plan, very well thought out! Can’t wait to see! I absolutely love the flow of the house on the left side, by the bedrooms. Your vision and talent is amazing. I’m liking the suggestion to open up the doorway between the family room and the dining room, although that may not be possible. However, I have another idea that might work out and get rid of the alcove between the pantry and family room. What if, along the back wall of the dining room, you centered a single window. Then, on either side of the window, you built two closets which would act as pantries. You could use one for appliances and one for food, or whatever. Then build a window seat between them. That whole wall, then, could look like a finished piece of furniture. Then, to the right, on the wall between the dining and storage room, you could build a closet out into the storage area. So, you would open the door in the dining room and there would be your freezer, but it would be sitting in the storage area enclosed by walls. It wouldn’t be taking up any square footage in your dining room, but be just as accessible. You would probably end up with a tiny bit less pantry space using those three areas than the one large pantry, but it might be something that would still work for you. Kristi, you shure have put a lot of thought into this newest floorplan. I don’t have any specific suggestions for you except to say, I totally agree with wanting/needing an exterior door somewhere in the bedroom side of the house. We are seriously considering putting on in our master bath into the backyard because our house is U-shaped, the other doors are a long way away, and the bedroom windows are very small – not suitable for any type of emergency exit. 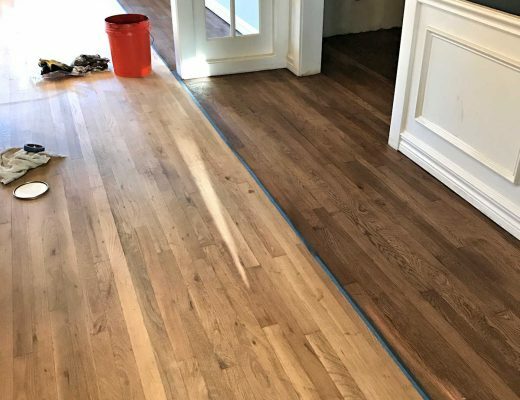 The only other comment I have is about the location(s) of the “wet” areas (kitchen, hall bath, utility room and master bath); right now, and in the future, they are in four separate places – that’s the most expensive way to go. If you could figure out a way to group the baths and utility room with a shared wall/plumbing stack, you could save a TON of money. Good news is, IIRC, you’re house isn’t on a slab. And, finally, no one should EVER do laundry at night or any other time that they are not able to keep a close watch. Washers and/or hoses can fail and FLOOD and dryers can catch FIRE; trust me, I speak from experience. Our washer flooded half our house in the middle of the day and I was just down the hall. Best wishes for a Merry Christmas and a Very Happy 2015! Looks really nice, but I do not see a master closet. Will it be tucked in with the master bath? Looks good to me!! I especially like the full circle in the center….that generally makes for an “easy to live in” home! Merry Christmas to you and Matt and I’m praying for God’s richest blessings for you both in the upcoming year. My husband is also in a wheel chair, so I will be very interested to see how you incorporate accessibility within the design. We just built a fully accessible home, but there are still things that could be improved upon. Can’t wait to see all your ideas come to life! Merry Christmas Kristi and Matt. Love the revised floor plan with the pantry addition. I’m looking forward to seeing your house take shape in 2015. You are by far my favourite blog. Cheers.